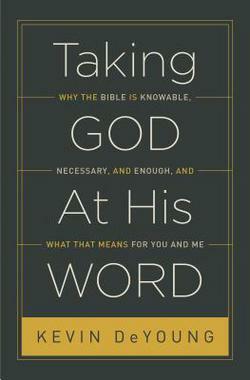 Taking God at His Word by Kevin DeYoung is yet another reminder that Mr. DeYoung is for real. He consistently churns out books which are readable and practical. But more importantly, DeYoung writes books which are biblical. His newest book is no exception. DeYoung challenges readers to consider the sufficiency, clarity, authority, and necessity of Scripture. This fine work will thrill conservative Christians and enrage liberals and postmodern compromisers. At the end of the day, our approach to Scripture is what really matters. DeYoung summarizes: “Submission to the Scriptures is submission to God. Rebellion against the Scriptures is rebellion against God.” May Christ-followers maintain a strong and robust doctrine of Scripture in the difficult days to come. Taking God at His Word is strong encouragement for faithful Christians who love the Bible.